Melbourne is a great city, in fact it's "The World's Most Liveable City", which we've all heard before but I've moved closer to the city recently and as much as public transport plays a part, I'd love to have access to a car that I don't have to take care of. In looking into other avenues I discovered Green Share Cars, which is an amazing, fairly new, but ultra modern way of getting around this issue. Most people may have seen their branded cars parked at different sides of town where I always look and wonder what this company truly is? Researching through their website, I found that this innovative group provides a convenient and Eco friendly car sharing service where they offer members the option of renting a car by the hour or day rather than having to own your own. What an idea! This functionality is reasonably new but is sure to catch on here and around the world. They have really covered all aspects to make it as easy as possible for members with the fact they provide petrol, insurance and access to vehicles 24/7. As well as this, the cars are continually cleaned, serviced and you will be provided with a replacement car if you breakdown. Melbourne is a city that continues to grow and bring new elements to its culture where Green Share Cars is clearly one of those elements. One look at their website is sure to impress with it being surprisingly easy to navigate and understand their service where their emphasis on it being environmentally friendly is comforting and important. They make it absolutely clear with their statistics and research that Green Share Car is "climate ready". This of course means the cars they provide are the highly economical Toyota Prius and Yaris. Easy to zip around in and get to wherever you need to go. This pioneering idea and the way in which they take all of the hassles away of owning a car will mean they are sure to grow in popularity. I feel like it would be perfect for the business types that need cars only on certain occasions or even families that have a home close to the city but don't own a car. Don't get me wrong, public transport in Melbourne is pretty good, but if you're a car person like myself than it is a luxury to be able to drive around from time to time. This service really is the next step in alternative travel and is the "missing link" to those who have been previously unsure of their options when it comes to owning a car and living in the city. 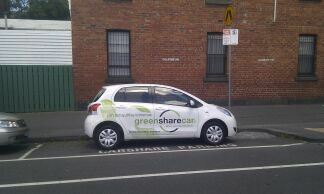 This mentality of not having to own a car is increasing where Green Share Cars is providing an alternative to those who are looking to make their travels in and around Melbourne a lot easier and much more convenient. With a move closer again to the city being on my calendar and my car slowly rusting in the carport, I feel like I could be one of those people getting on board this easy, modern and innovative service.